The Monarch-Chesterfield levee, in suburban St. Louis, is about to get beautified by a creative, fun community project that could be a good starting point for a wider discussion. …a free, community-based project that is providing a unique leadership opportunity for students from across the region…This Student Leadership Team has been working since July  on Phase I of the project, which includes creating the design for the mural. With the help of professional artist Stuart Morse of Morse Fine Art Studios, the team has been getting creative with concepts that will transform the levee and the future Great Rivers Greenway recreation trail. A constructive activity for teens. Enhancing area recreation. That seems like a good project for teens and community residents, right? So, what’s the problem? The levee is designed to protect St. Louis County’s Chesterfield Valley from a 500-year flood. 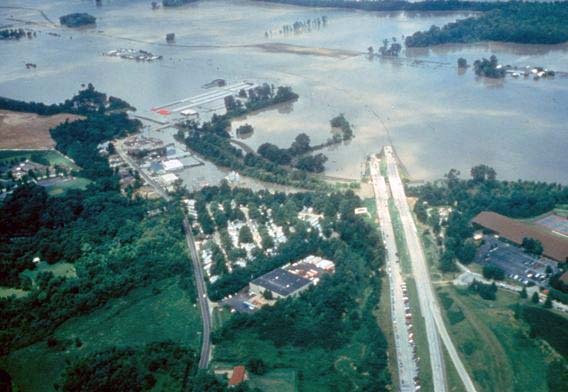 In 1993, when the existing Monarch levee failed, Chesterfield Valley [previously known, more descriptively, as “Missouri Bottoms” and “Gumbo”] was inundated with more than eight feet of Missouri River overflow. Local residents recall the dramatic images of a main east-west highway [now I-64/40] completely cut off by flood water, and an area landmark—the Smoke House Restaurant—up to its top liquor shelves in muddy water. Before it was over, many of the 300 businesses then in the Gumbo area were flooded. Because of the flood, FEMA required the existing levee to be recertified. The history of the levee is closely tied in with commercial development. In the early 1980s, Spirit of St. Louis Airport opened in the area, prompting St. Louis County to upgrade what was then a much lower, agricultural levee to a structure made to resist a100-year flood. In 1994, after the flood, the city of Chesterfield went a step further, creating business-friendly tax-increment financing [TIF] to attract commercial development to the valley. In 1997, that incentive brought THF—a Wal-Mart developer—into the valley. THFcreated Chesterfield Commons, which has evolved into the longest [2 miles] big-box shopping strip in the country. THF’s presence sparked even more development, and the Monarch-Chesterfield Levee District gained the funds to finance the improved, 500-year levee. An estimated $2.2 billion worth of new commercial and residential development currently stands on land that was under water in 1993. The levee district itself has spent more than $20 million on the levee’s system of pumps, spillways, berms and gates. And today, the now-more-appealingly named Chesterfield Valley, once a huge, natural flood plain, is a huge retail mecca protected by a levee system, jointly funded by the levee district and the federal government to the tune of about $70 million. Meanwhile, downriver in Tennessee and Mississippi, similarly costly levees along the Mississippi River have been blown up, and spillways have been opened in an effort to alleviate flooding and protect commercial interests. The result of these desperate measures has been a mixed bag of good and bad news: One the plus side, saving Cairo, Illinois, and protecting New Orleans from another waterborne disaster; on the minus side, creating a Mississippi tsunami for farmland, thus destroying an entire growing season for farmers. The sharp contrast between decorating one levee and blowing up another should give us pause and make us think about: the reasons [for good and bad] that levees exist; their environmental and economic impact; the role of the U.S. Army Corps of Engineers; the private, financial interests that influence their placement and construction; and the relative merits of the overall public good versus the private sector’s needs. A good time to think about these issues might be while slapping some paint on that wall on June 4. The organizers of the paint-by-numbers project respectfully request, though, that you act like a nice, domesticated little river and stay between the lines.